Dr. Sarah Padrnos-Hulen O.D. is a Flagstaff native. She attended Arizona State University and received a Bachelor’s degree in business management. After working for several years in marketing, Sarah decided to go back to school and follow in her father’s footsteps. 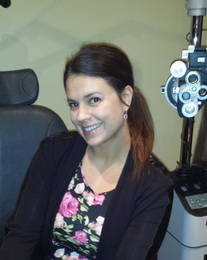 She was accepted into the Houston College of Optometry program and graduated in May of 2014. Sarah enjoys cupcakes, red velvet cake, caramel apples, german chocolate cake, watching TMZ, reading people magazine, and sleeping in till noon. For appointments with Sarah please request our staff to schedule an afternoon appointment.